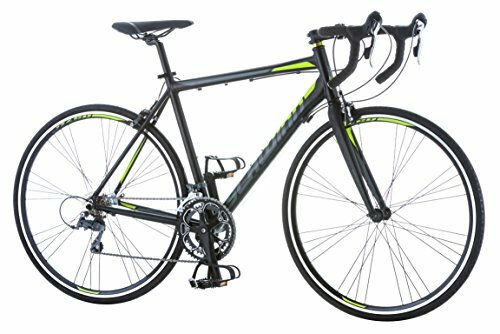 The Schwinn Phocus 1600 Road Bike is the ultimate drop bar cycle in the market. Assembled with a responsive and lightweight body, the Schwinn Phocus 1600 bike comes fortified with a carbon fiber fork to complement your riding. The bike ensures you burn those calories due to its stern and rigid build ensuring you reach your daily fitness goals as the bike itself carries tops about 23 pounds. Dreaming of a smooth ride? A bicycle ride to be specific. Well thanks to Schwinn, you can experience that rare luxury while cycling due the lightweight fork and quick shift gears. The bike will ensure you exercise as you move towards your destination. Burning those calories while getting from point A to point B might just extend your life and help you pass your cardiovascular exams. The saddle has a quick release to enable individuals to adjust according to their respective heights. This was in a bid to curb the issue of the bike coming with one size frame. This adjustment will ensure almost everyone in your family gets a ride on it. The brakes on this bike are powered by Promax to ensure you stop in whatever weather or environment you could be. The front wheel is a quick release, and the braking system gets finalized by a perfect crafter clipper made from alloy. This will guarantee you of safety for both you and your family members. Makers of the road bike ensured you get a product that is entirely lightweight to increasing its portability. You can carry the bike on your back in case you need to. This will also ensure your speed doesn’t curtail in any way. The bike also comes with several inbuilt features such as a quick gear switch and so many others. Below are some of its inbuilt properties that will guarantee you on why you should order this comfort bicycles right away. Extended gear range from the Schwinn alloy crank. A carbon fiber road fork. Comes with a full Shimano fourteen-speed drivetrain Comes also with double wall alloy rims that are light but too strong to enhance durability. Brakes come equipped with a Promax alloy caliper disc to facilitate an all condition stopping. The Schwinn Phocus 1600 can’t be used in a competitive field, but all its users would agree that the bike does act like a personal trainer and is a must for all casual rides to the mall or campus. When it comes to riding, the bike provides a smooth red courtesy of the 700c wheels accompanied by the alloyed rims. The carbon fiber fork ensures there are no shocks when riding this cheap bike. Schwinn came up with an easy sell when they ensured it’s light, durable and smooth.